What is the best way to describe the Ariba network? One customer tried to liken it to Amazon.com — a marketplace not of books but of trading opportunity wherever one might be in the world. Think of Ariba as a club whose member’s share the same benefits in the cloud. Joining the Ariba network would be like extending your reach beyond the walls of your company, getting to know other businesses around the world and exploring the ways you can learn from/ share know how / transact with them. A traditional notion of business would be two-dimensional. You procure materials from your suppliers at the lowest cost, process these materials and sell them to maximize revenue. In actual practice, however, it is not that simple. Various software would be used by various business units, and by decision makers. The volume of information shared would be tremendous when you factor in the transactions made between and among businesses. All the other businesses, after all, also buy and sell and manage their cash and manage their risk. At some point, the software used by the individual units would no longer be able to keep up with the sheer number and complexity of transactions. There will be delays and errors and wastage and losses and opportunities forgone. The solution? Get ahead and stay there by hooking up to the Ariba supplier network. The Ariba spend management will enable you to be among the enlightened ones who have taken advantage of the network economy for their companies’ — and their shareholders’ — benefit. What’s more, Ariba has recently joined the SAP family. It merges its its cloud computing, social media and online networking strengths with SAP’s track record and expertise in providing end-to-end business solutions. But why Ariba? What does it mean to let it drive your procurement processes? Ariba has established its competence in bringing businesses together. Through the power of the cloud– Internet technology — the benefits of having a single, simple online software for buying, selling and managing cash would be realized in full. Through Ariba sourcing, your company could gain access to over a million global companies — with a new one being added every few minutes. Find the best procurement arrangements with similarly forward-looking, like minded business decision makers like yourself. 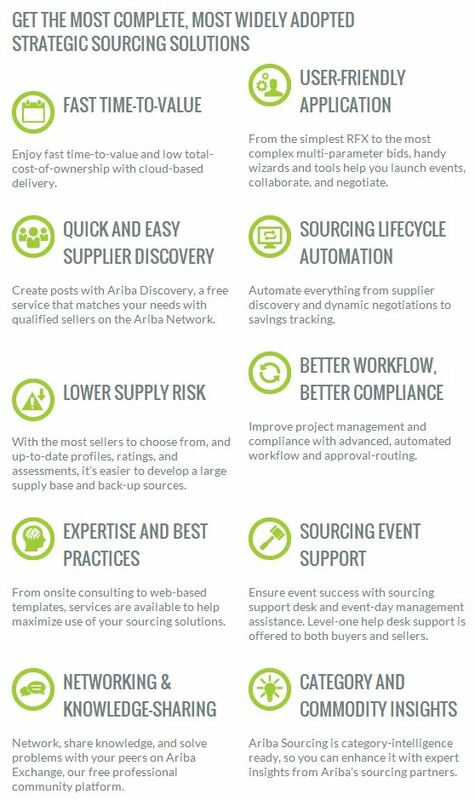 And then, the Ariba supplier network will empower you by presenting all your options and giving you the freedom to choose which supplier best meets your needs. You can then also join the Ariba supplier network by being among the numerous companies offering your products and services to others down the line. That SAP and Ariba now belong to same family means that the sourcing, procurement and contract management capability of the latter has been fully integrated into the SAP suite. What more can your company seeking to find its place in the global commerce ask for? Slow and costly paper-based transactions would be thing of the past. There will be access to an entire universe of qualified global suppliers and buyers. Processing of invoices would be up to par with international standards. Ariba spend management would be the single best decision you would ever make. See your costs drop, your revenues rise, and your business become competitive. Join this network and wonder why you never heard of the Ariba network sooner. Arriba means “up” in Spanish, and there could not have be een a more apt name for what it tries to do — take your business up to the next level, and up there in the cloud, too, where everything is easier, faster, more flexible and ultimately best for you. Philippine companies would now have access to this formidable partnership through Fasttrack Solutions Inc., a leading SAP partner in the country. Find out more about Ariba and what it can do for your company.